Have you ever found yourself in a relationship situation where you’re constantly calling the girl, taking her out and being devoted, sweet and kind to her only to get games, drama and inconsistency in return? While most women want to be with a man who treats them right and is ready for commitment, there are selfish and opportunistic women who intentionally take advantage of men and relationships. Here are 5 tips on how to tell if she’s just using you. She repeatedly tells you how interested she is and how much she wants to see you; however, when dates are scheduled, she cancels at the last minute or something always seems to come up to prevent the two of you from meeting unless she needs something from you.There’s a chance this woman doesn’t enjoy your company at all and is in fact using you. If the girl seldom returns your calls in a timely manner, always has a busy schedule and only calls when she wants something from you or needs a favor, it should be clear that she is using you and that you are not a priority. A woman that desires you will create time in her busy schedule to be with you. But If she only makes plans with you at the last minute, as if nothing better came her way or when plans with her friends fizzle, you’re pretty much an after thought and her last resort when she’s bored. A normal couple alternates in buying each other dinner and gifts; however, there are many situations where women only see men as a source of movie tickets and food or, even worse–a rent check or a down payment for a car. Ask yourself the following questions: Are you constantly buying things for her and receiving nothing in return? 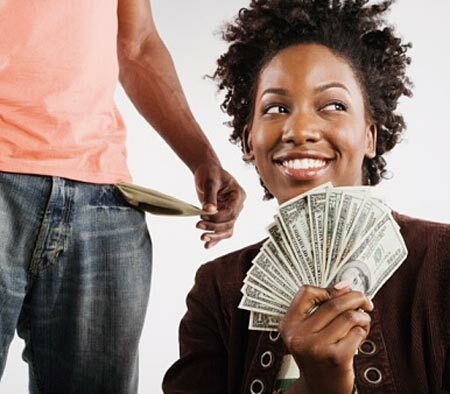 Do you always pay when you go out and find yourself spending more money on her than you counted on? Does she borrow money from you but never pays you back? Does she write you off whenever you’re not spending money on her? If you answered yes to these, the lady in your life is a gold digger. If she only has short term plans about your relationship, gives no answer when you ask about what your relationship will be like three years from now and always avoids talking about meeting her friends or parents, she is more than likely using you to fill a temporary void in her life until someone better comes along.